Disgraced former Liberal MP Andrew Cornwell will face a move to expel him from the NSW Parliament as early as this week. Greens MP Jamie Parker will move for Mr Cornwell's expulsion on Tuesday – and is challenging Premier Mike Baird to support his motion. 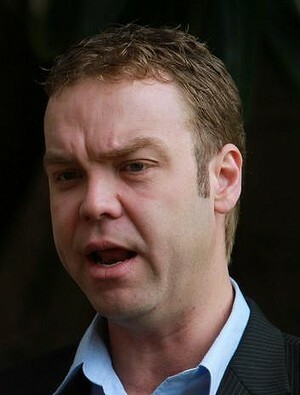 Mr Parker decided to move for the first-term MP's expulsion after consulting his party over the weekend. This push for a rare expulsion follows Mr Cornwell's admission to a corruption inquiry he had accepted what he believed was a $10,000 bribe from a property developer and used it to pay his tax bill. Mr Cornwell also admitted to the Independent Commission Against Corruption taking an envelope containing $10,000 in cash from another property developer, which was used in his campaign to win the seat of Charlestown at the 2011 state election. Property developers have been banned from donating to NSW political campaigns since 2009. Mr Cornwell resigned from the Liberal party on Friday and announced he would take leave. Mr Parker said arguments Mr Cornwell should be afforded the presumption of innocence until a finding was made against him at ICAC did not apply. "Mr Cornwell has confirmed under oath to the ICAC that he accepted a prohibited political donation and accepted a bribe from a property developer," Mr Parker said. "In no other profession would a person who admitted corrupt behaviour retain their job and entitlements and also be granted leave on full pay. Parliament must act to protect its reputation or it will stand condemned as a haven for corruption and illegality." The decision to move for an expulsion – which if successful is likely to spark a costly byelection just seven months from the March 2015 election – had been taken only after "very serious and careful consideration, including consulting with the Clerk of the House", Mr Parker said. "Any Member of Parliament who is serious about an ethical and honourable democracy should support this motion," he said. For the motion to succeed it will need the support of the government, which controls the numbers in the Legislative Assembly. Mr Baird has refused to comment on whether Mr Cornwell should remain in Parliament. On Friday, Opposition Leader John Robertson said the Labor Party would "look at all the options open to the Parliament in relation to Mr Cornwell continuing to sit as an MP". According to the NSW parliamentary library research service, only four MPs have been expelled from the NSW Parliament: three from the Legislative Assembly, in 1881, 1890 and 1917, and one from the Legislative Council, in 1969. A briefing paper notes the 1969 expulsion of Country Party MLC Alexander Ewan Armstrong was challenged in the NSW Court of Appeal, which confirmed the Parliament's power to expel members. Mr Armstrong was expelled following allegations he forced a company director to buy shares he owned. The director, Alexander Barton, claimed he bought the shares because "he feared for his life", according to a 1985 obituary published in the Herald. The court said the expulsion power was not designed to be used as a punishment, but as a means of retaining public confidence in the Parliament by protecting its dignity and efficiency.